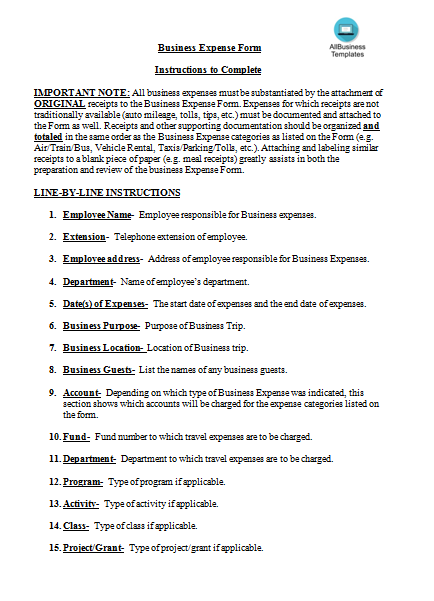 How to make a Business Expense Form in MS Word? An easy way to start is to download this Business Expense Form Template now! Business forms are essential business documents used for business transactions and other business correspondence. Many businesses require forms for legal purposes as well as for simple processes such as work orders or invoices. Business forms needed to be well written to provide proof for any dealings within and outside the company. Streamline information. Business forms require particular information to be filled in which are sometimes based on different categories. This information is then streamlined and recorded for future use such as disputes and other legal matters. Help projects move along. With business forms, each step of the production process of any project is passed on efficiently and help move it to the next phase once these forms are approved by the fitting authority. Builds stronger relationships with customers and clients. Business forms are indicators that your business is legal and generates trust from your customers. With a signed document from each party, one wouldn’t think that he is being scammed or swindled. Now we provide this standardized Business Expense Form Template with text and formatting to help you finish your document faster. If time or quality is of the essence, this ready-made template can help you to save time and to focus on what really matters! Download this Business Expense Form Template template now for your own benefit! This template will perfectly suit your needs! And after downloading you can craft and customize every detail of its appearance very quickly.